The 1989 World Tour was the fourth concert tour by American singer-songwriter Taylor Swift, in support of her fifth studio album, 1989 . The tour's European and North American dates, as well as two shows in Japan, were announced in November 2014, followed by the Oceania dates in December 2014. Additional dates for Singapore and Shanghai were announced in June 2015 with a third and final Melbourne show announced in July 2015. The tour began on May 5, 2015, in Tokyo, Japan and concluded on December 12, 2015 in Melbourne, Australia, the day before her 26th birthday. The tour became Swift's highest grossing and most attended tour to date, mobilizing 2,278,647 fans and $250,733,097 in revenue. It was the highest grossing tour in the world in 2015. 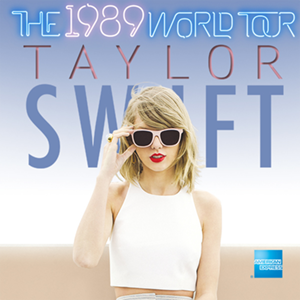 The 1989 World Tour was the fourth concert tour by American singer-songwriter Taylor Swift, in support of her fifth studio album, 1989 (2014). The tour's European and North American dates, as well as two shows in Japan, were announced in November 2014, followed by the Oceania dates in December 2014. Additional dates for Singapore and Shanghai were announced in June 2015 with a third and final Melbourne show announced in July 2015. The tour began on May 5, 2015, in Tokyo, Japan and concluded on December 12, 2015 in Melbourne, Australia, the day before her 26th birthday. The tour became Swift's highest grossing and most attended tour to date, mobilizing 2,278,647 fans and $250,733,097 in revenue. It was the highest grossing tour in the world in 2015. On December 13, 2015, Swift announced that she had partnered with Apple Music to release a concert film entitled The 1989 World Tour Live on December 20. It was filmed at ANZ Stadium in Sydney on November 28, her largest show to date with 75,980 attendees.